Achilles The 'Psychic' Cat Predicts Russia Win In World Cup Opening Match Achilles is a designated rat hunter at Hermitage Museum in St. Petersburg. The museum veterinarian said the cat "loves his motherland and couldn't vote otherwise." 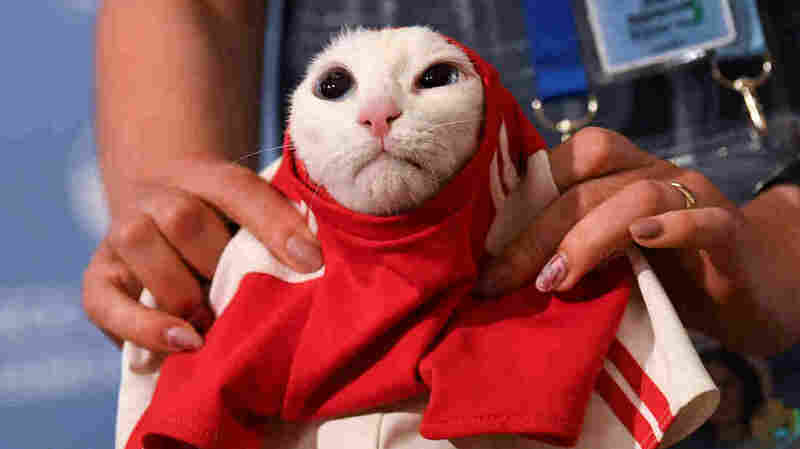 A participant dresses Achilles the cat in Russian colors on Wednesday after predicting a win for Russia against Saudi Arabia in Thursday's opening match. 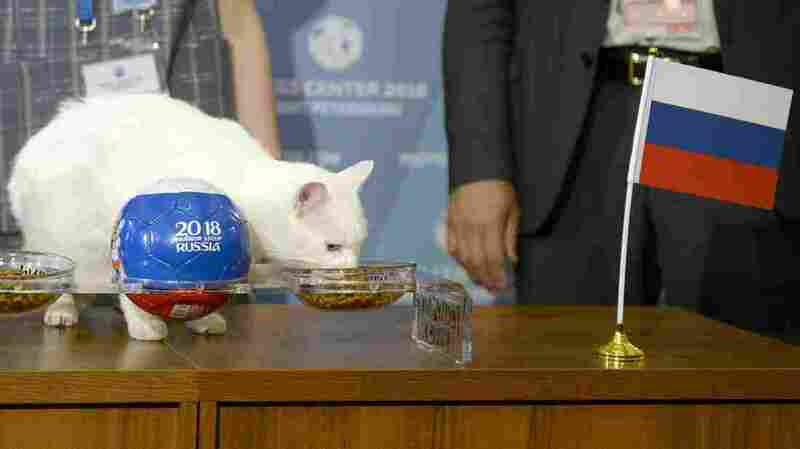 He picked between two bowls of cat food, and chose the one marked with the three colors of the Russian flag — "however not without hesitation," according to Russia's state-owned Tass news agency. Achilles the cat predicted Wednesday that Russia would win its game against Saudi Arabia. He's been training hard as an official animal psychic. Achilles is a white cat who lives in St. Petersburg's Hermitage Museum — one of about 50 to 70 cats tasked with catching rats in the museum's basement, Tass says. Museum veterinarian Anna Kondratyeva told The Associated Press that he "loves his motherland and couldn't vote otherwise." Achilles has been hard at work as of late to prepare for the World Cup. He's been "training to shed weight and get more fit" over the past year, according to the news service. He's deaf, which in this case is an asset as it "lets him better concentrate" without the distraction of people talking and camera noise during his press appearances.